thoughts & happenings: A thing or two. It landed on the clothes line in the caravan park in Rockhampton, luckily I had the camera out of his carry bag and ready to shoot. 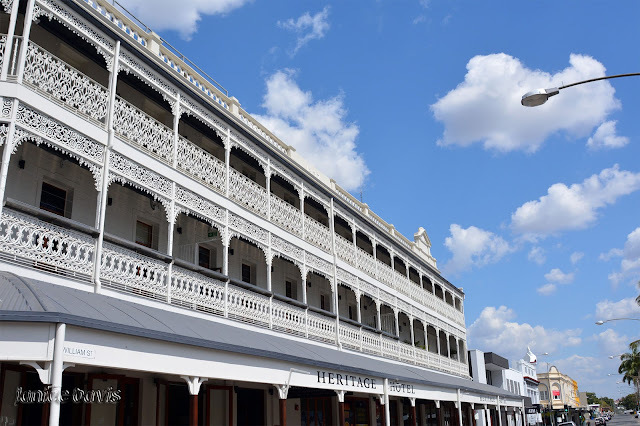 The Heritage Hotel was built in 1898 and it's address is Quay Street. The Hotel was closed for two years and re-opened in June 2017. Previous names Old Colonial Hotel and Commercial Hotel. For those interested in the History of the Hotel have placed a link [here]. I LOVE the lace on that Hotel, it's so beautiful. Did the Kookaburra laugh at you? No, that Kookaburra just sat there till photo was taken then flew off. Gorgeous lattice, stood out well. When I was a girl we sang a song at summer camp, "Kookaburra sits on the old gum tree, merry merry king of the bush is he. Laugh kookaburra laugh kookaburra, gay your life must be." Now I know what a kookaburra looks like! The hotel is an absolute classic. Beautiful it is. Lucky it had been painted recently. El ave, se te ha puesto a tiro, para que lo fotografiaras. Yo creo que quería salir en tu blog. Me gusta las hermosas rejas de la terraza del hotel. Tienen un artísstico trabajo de artesanado. Not always easy to get a good photo of a Kooaburra with my camera. Beautiful work on the wrought iron. 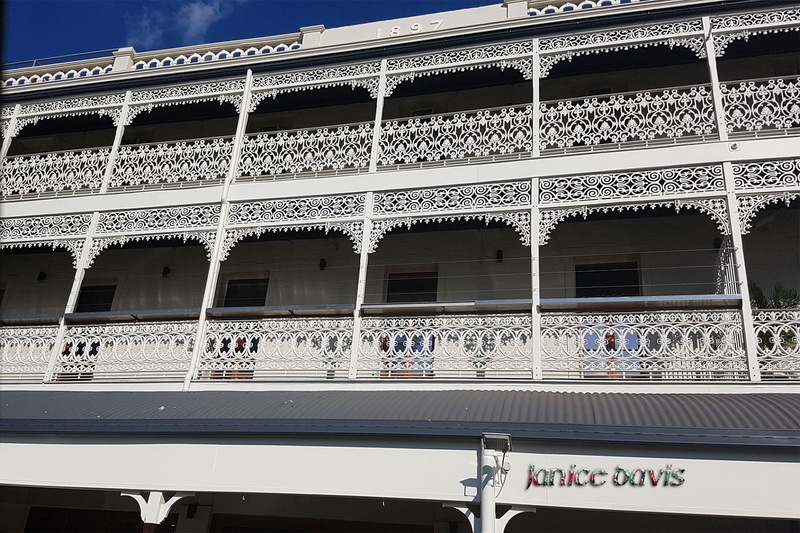 Wonderful old hotel with architecture in a grand style - and what a bonus to have the Kookaburra come and visit. Was surprised to see the bird there. Newly painted was the hotel. wow it sounds love I heard on Andrew's blog. The work is fabulous there is a name for it out it eludes me at the moment. Gosh that would be noisy with a kookaburra. I loved the Kookarurra, fine bird. They are indeed and we don't always see them when travelling but this year we did see many. Well done capturing a great photo of the kookaburra! The fine wrought metalwork railings are like lace! So amazing & beautiful! The wrought iron is excellent, stood out. The hotel looks very beautiful!! It certainly caught my eye. The hotel has class. From you photos it reminds of a Mississippi River boat. Oh yes I expect the hotel does as I have seen in photos all the fancy work on the boats that sail down the Mississippi River. 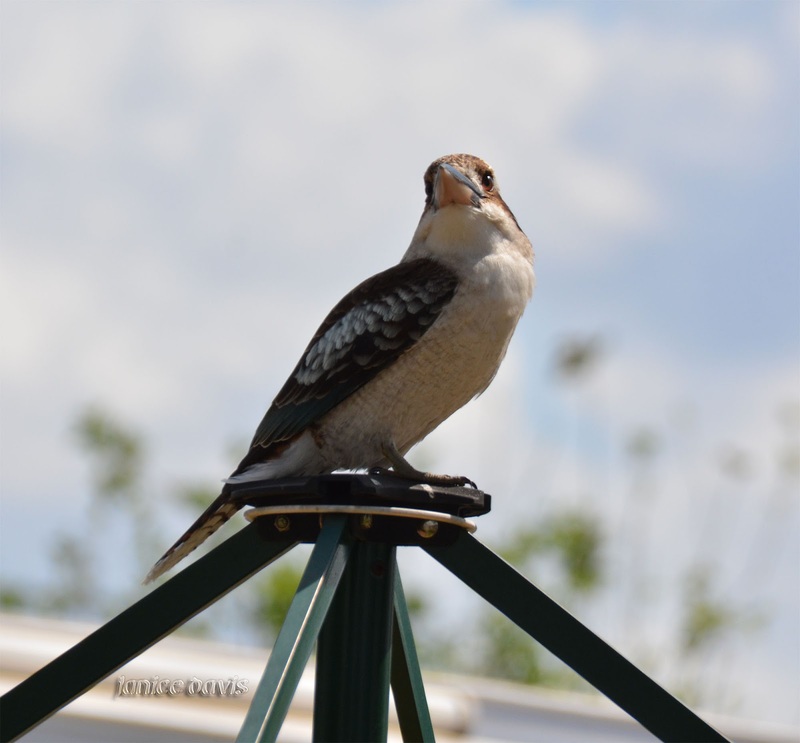 I really like Kookaburras as we don't see them often here anymore because we have no bush behind us as we once did. Interesting regarding your sister in law feeding them, that was nice of her. like this one have been forced into liquidation. You know where you can lay the blame for this at! I have never heard of a kookaburra being kept as a pet. Somehow I am sure that these wild birds would die from caging..........they are a free spirit and anyhow they are darn near everywhere for people to see and appreciate in their native state. Here where I now live kookaburras are everywhere.......they seem to "laugh" even at night from all the road lights etc. Some days a flock of them make such a racket you need ear-plugs! I've had a pair on my porch making themselves quite at home but I am not too happy with their generous gifts from their bowels! ha ha. Yes that hotel is back in business that's why it looks so good on the outside, one couldn't help but not miss it as the white stood out. Ha! Yes, I presume rather a mess then after being on your porch, that's one of the down sides to birds/animals. Oh it's hard to believe that people try to keep them as pets, not a nice thing to do. What a beautiful hotel, facade like lace. A big hud to you. It is a lovely hotel - thanks for the hug and to you too. This architecture is really elegant. I am glad this hotel reopened. Nice hotel with all these special figures. Wonderful shot of the bird. Very fancy is that hotel, don't always see one that lavish in style. The hotel is very beautiful with its ornate and intricate lace work. AMAZING shot of kookaburra dear Margaret! this hotel is really charming ,fences look like brilliant quilt to me ,so pretty indeed!